Many of you have been enjoying the Oberbaierische Festtäg- und Alte Bräuch- Kalender for some or all of the last almost 30 years of its publication. You may not know that the beautiful large format calendar is the inspiration of a great couple, Matthias “Hias” and Brigitte Raab. The whimsical artwork throughout the issue is thanks to artist Hias; the couple’s love of Heimat shows through on every page. They travel all over to get many of the wonderful photos, participating in Feste throughout Bayern. Hias and Brigitte, along with their children and their graphic designers at their printing firm, have done such a tremendous job over the years of showing all things traditional in Bayern. 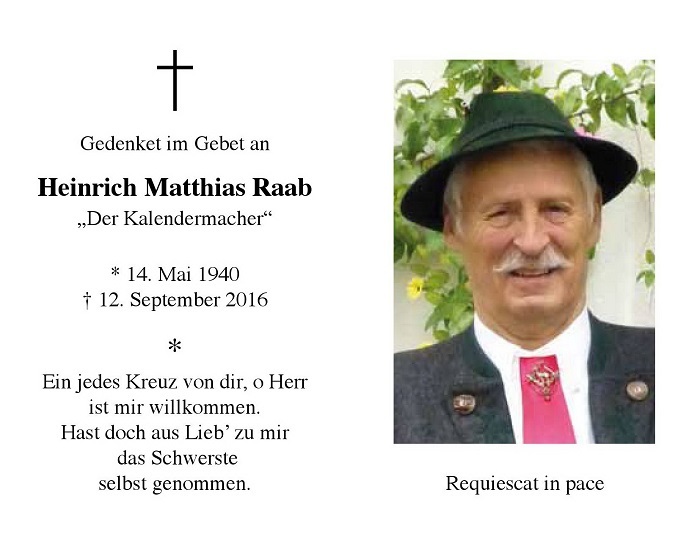 So it is with great sadness I heard that Matthias Raab passed away suddenly on September 12 at the age of 76 at his home in Iffeldorf. His funeral will be Friday, September 16. Ruhe in Frieden, Matthias Raab.